October « 2015 « Delish Home Cook - Asian inspired, FODMAP, gluten free and more..
We had a few friends over for drinks including Bill. Bill is highly sensitive to many food. He has a diet that is low FODMAP + gluten free + no additives + no quirks. I found cooking for Bill challenging, as he gets sick for days if he eats the wrong food. Here are some delicious beef balls that I cooked for Bill and to share with friends. So simple and nutritious. This entry was posted in 4. Fusion / modern, All posts, FODMAP, Gluten free and tagged Beef pumpkin potato herb balls, Coeliac recipe, FODMAP diet, fodmap friendly, Gluten free, home cooking, IBS diet. If you like flavorsome, juicy & tender white cut chicken, you should try this recipe with Chinese rice wine. So simple and no recipe required. Bring a pot of water to boil, drop in 1 inch of ginger (sliced), 2 inch of lemongrass (lightly bashed), 2 chicken breast fillets (whole) and season with salt; bring the water back to gentle boil; turn off the heat and leave the pot on the stove (not turn on) for 25 minutes or so; Check the chicken, this should be just cooked after 25 minutes; Slice the chicken into strips and pour over Chinese rice wine that is just enough to cover the chicken pieces; drizzle with some sesame oil and a small dash of soy (optional); leave the dish aside in room temperature for a while (30 minutes) for the flavor to develop; Serve at room temperature or chilled; Garnish with chopped shallot that’s been quickly pan fried in some hot oil then dusted with some sea salt. This entry was posted in 1. Delicious Asian Food, All posts, Chicken, Gluten free, Mains (Asian) and tagged Asian food, Asian slow cooked chicken, Chinese food, Gluten free, home cooking, poached wine chicken, Recipe. There is a school fair in a few weeks and I am making lots of food for the Asian Food Stall. Last year for the school fair I did fusion style chili puffs with Sichuan chili soy bean sauce. This year I made another fusion puffs with Malaysian curry. To make it easy for myself (150 puffs), I used the packaged Malaysian curry with beef, potato, leek, capsicum and peas. I have made and freeze the puffs and will cook them on the day of the school fair. These little puffs are so tasty, wish you could try one now. This entry was posted in 1. Delicious Asian Food, All posts, Dumplings / Dim Sims, Entrees (Asian) and tagged curry puffs, spicy puffs. I love my ‘ordinary’ chickpeas stew with spicy chorizo. The other day, I was feeling a bit bored so I ditched the chorizo for bacon and Asian spices – nearly the same thing, right? I first cooked the dry chickpeas, with some salt & water in the pressure cooker for 15 minutes on high. 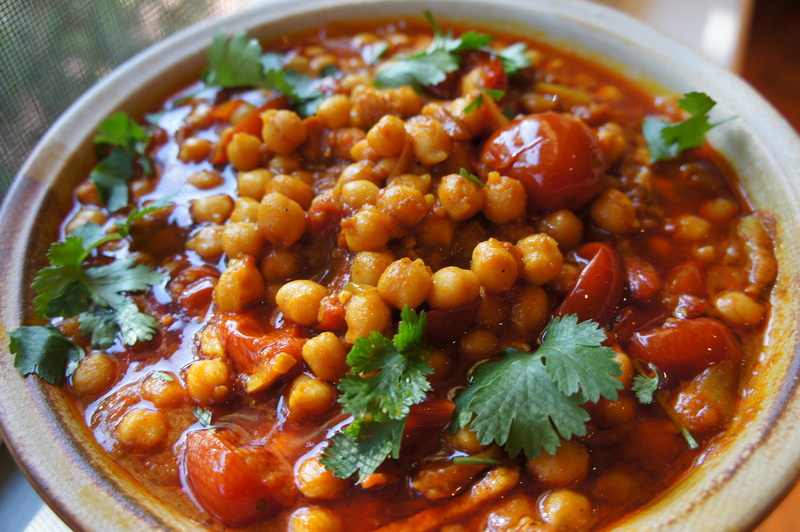 I added some cooking oil in a frying pan, sauteed some bacon, onion and garlic before adding turmeric, garam masala and extra cumin; I added the chickpeas to the frying pan, gave it a little stir; then transferred the ingredients back to the pressure cooker with tinned tomatoes. Another 15 minutes on high, and lunch was ready with some crusty bread. So easy and delicious. This entry was posted in 1. Delicious Asian Food, All posts, Gluten free, Mains (Asian) and tagged Asian food, bacon, chickpea, Cooking, cumin, Food blog, garam masala, Recipe, spicy chickpea, Tomato, turmeric.